How do you send the purest, warmest and most natural signal out of a high-impedance instrument to a balanced mic input at the console? 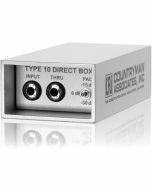 Countryman's Type 85 Direct Interface box. Reflecting the ultimate engineering and highest-quality materials, the Type 85 DI Box adds nothing and removes nothing from the instrument's signal. No distortion. No electronic hum or buzz. No loss of dynamic range. It's the only active direct box that delivers such a clear, strong, warm signal to the mixer. Input circuit withstands 220V AC all day long, and static spikes up to 20,000 volts!